Tactile Dome Test Procedures - Learn About Our Force Testing Setup | Snaptron, Inc.
Machine – Electronic force displacement test gauge. Test Probe – .050″ (1.27mm) diameter with flat bottom for domes 5mm and greater or .032″ (0.813mm) diameter with flat bottom for domes less than 5mm (0.197″) (test method recommended ASTM 2592). Fixture Pocket – Steel with milled recess for dome to be place in for proper centering. Position the center of the dome to be tested within .010” (0.254mm) of the test probe center. The test probe must be perpendicular to the dome. The dome must be on a hard flat surface, and needs to be vented to avoid air entrapment. Air trapped under the dome will increase the trip force and give a false reading. Dome should be clean and free of carrier tape and/or adhesive. Test speed 0.050″ [1.27mm] per second. Precondition the dome with 10 actuations using a 0.050″ (1.27mm) test probe. On the 11th cycle, the gauge will collect dome characteristic results. 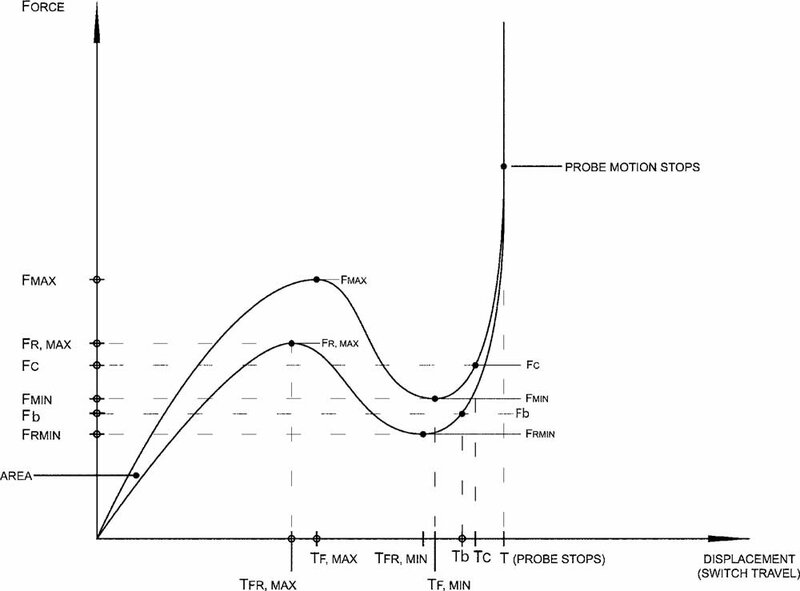 The force and displacement values when converted to a graphic curve can be used to distinguish the differences in tactile switch performance. Shown on the diagram below, the “Y” axis is the force characteristics and the “X” axis shows the displacement (travel). The curve on top represents the forward travel of the switch to the contact point, while the lower curve shows the return travel of the switch to the open position. A variety of force and displacement (travel) characteristics can be graphically displayed, depending on the type of data collected by the measurement device. See below for a definition of terms. This is provided for a visual reference only. Domes are tested on a hard flat steel surface perpendicular to the actuator test probe. The actuator test probe is a Delrin plastic and is centered over the dome within +/-0.015” [0.381mm]. Dome is attached by a means of plastic tape using pressure sensitive adhesive and MUST provide venting for the dome. The test to run continuously at approximately 3-12 cycles per second. Actuator test probe at a diameter of approximately 25% of dome diameter. Life testing is performed in accordance with ASTM F1578 (Standard practice for contact closure cycling of a membrane switch) less electrical resistance testing. Failure is defined as the dome cracking before the specified cycle rating.